The town council last night expressed unanimous opposition to the sale of the Territory Insurance Office (TIO), proposed by Chief Minister Adam Giles, and rejected several of his proposals for local government reform. Councillors had serious concerns about threats to democratic processes, and about what ballooning costs for flood cover, which seen inevitable if the insurer is sold, would have on the local economy – and the council budget. The council was sitting in committee, making recommendations for the formal council meeting in a fortnight. Cr Chansey Paech asked: “Can residents afford” sharply increased premiums in a “struggling economy”? 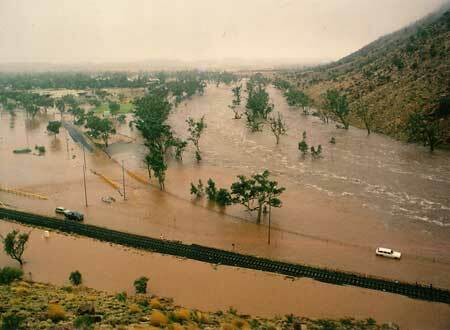 Alice Springs is built on a flood plain but homes and businesses insured by TIO are currently secure under the automatic flood cover of the Territory Government owned company. He said the mayor of Katherine, which had suffered serious floods in 1998, opposes the sale. In a statement released after the meeting Cr Paech said: “The CBD, large parts of the Golf Course, Old Eastside, the Gap, Sadadeen and the rural area on the eastern side are vulnerable according to flood maps produced by the NT Government. When Director Finance Paul Della was asked if increased costs of insurance would affect rates, he said the added expenses had the potential of being passed on. 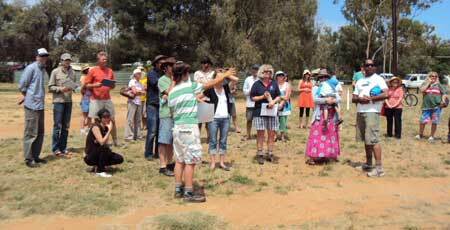 Mayor Damien Ryan said the the council had opposed the plans of the previous government for selling TIO. Deputy Mayor Kylie Bonnani said the council should ask Mr Giles in a letter to specify what projects a sale of TIO would bankroll, and to give guarantees they would go ahead. Cr Steve Brown said TIO “used to keep prices down” and he would be “very concerned” if the insurer were sold. Cr Eli Melky criticised the lack of consultation, and said the role of TIO in sport and community sponsorship may end. Giles’ changes to local government ‘a foregone conclusion’? The council rejected five out of 11 recommendations for changes in local government put forward to the council by Mr Giles, referring to a report “authored” by the NT Electoral Commission. The council accepted one recommendation with grave reservation. These issues will also come before the next council meeting for decision. Last night the council seemed inclined to have the four-yearly election moved from March to August. This would avoid holding the poll during the wet season – a big issue in the Top End – and newly elected members would have more time to deal with the annual budget, handed down in June. It would give new members a longer “learning period,” suggested Cr Paech. But the mood of the meeting was clearly against deferring the next council election by 18 months. • allowing the amalgamation of ballots in single member vacancy vote counts. • extending postal voting and early voting services to all voters. He said the present council would get a “free ride for 18 months” and the principle of councillors being held accountable to the public after a set term would be “violated”. CEO Mooney, making it clear he was expressing his own opinion, said it is “not democratic” replacing a councillor by nomination. He said councillors are referred to in the Local Government Act as “elected members” and not “appointed members”. In local government “you put your hand up and stand for elections”. To become a councillor by a “tap on the shoulder” is in conflict with democracy. Cr Jade Kudrenko said she would not be “comfortable” with an extended term of the current council. Meanwhile the public parks management plan remains a work in progress. Cr Paech said the consultation via the council’s website so far has been inadequate – with a few more than 100 people responding. The public seemed solidly opposed to the sale of parks, and Cr Melky pointed out that none are on the market. But it was clear there is not enough shade, and play equipment is aging and perhaps dangerous. There have been solid expressions of interest from residents in helping with the maintenance of parks, and the Eastside community garden (PICTURED above left, during its planning in 2010) was mentioned as a good example. Cr Brown said parks, or parts of them, should be sold only if the money was spent on parks improvements, and provided the community agrees: he is not in favour of “imposing a position”. RELATED READING: Bye-bye TIO, hello massive flood insurance premiums? Spot on, Alex Nelson (Posted November 13, 2014 at 10:42 am). I couldn’t agree more: it’s the only interpretation that makes sense of the situation. And to be fair, it probably only applies to a few of the more dominant members of the current CLP caucus. Political office shall not weary them, because they will be flitting off to more profitable feeding grounds as soon as they are able, or as soon as they are dumped from office, whichever comes first. Sean’s comment is closest to the truth. This CLP government has adopted a “crash through or crash” approach to major policy decisions in the NT. With the possible exception of former Chief Minister Ian Tuxworth in the mid 1980s, this behaviour is in striking contrast to the way the CLP operated during its previous long tenure in office. Regardless of ones political viewpoint, the fact is the previous CLP government maintained a very close eye on public opinion and responded accordingly. The Chief Minister’s Office had a first class research unit operating within it and provided the material by which the government vigorously defended and / or promoted its position on various policy issues; or alternatively changed its direction when public opinion clearly necessitated the need to do so. This was a major factor in explaining the 27 year longevity of the previous CLP administration – it was, in fact, an extraordinarily well-honed political machine focused on its long-term survival. It was the most successful political party of any government in Australia but ultimately lost this capacity with the rise and gradual dominance of lack-luster members during the 1990s. Once Shane Stone departed the scene, the writing was on the wall. The current CLP government displays none of the skills of its forebears, especially with regard to public relations. The CLP today is very much a shadow of its former self. I suspect this is deliberate. The key politicians making the critical decisions today affecting the NT’s developmental prospects appear to be unconcerned for their long-term prospects in holding public office, which strongly suggests they will in the long term be beneficiaries of the businesses, corporations and industries that currently stand to gain so much from this current administration. He’s never been here during a serious flood, Observer (Posted November 12, 2014 at 3:16 pm). Adam Giles is of the view that there is only minor angst against the sale? Wrong! I am yet to meet a single person who believes this is a good idea. There will be considerable backlash – Territorians will not forget this come the election. There will be a high political price for going against the will of the people – his employers and the true owners of TIO. TIO is designed to serve the people of the Territory. Upon its sale it is there to serve the share holders. Adam – you have lost touch. I implore you to prove you are a representative of the people. Well done council! Unfortunately it won’t matter … until August 2016. Adam thinks he’s a law unto himself.